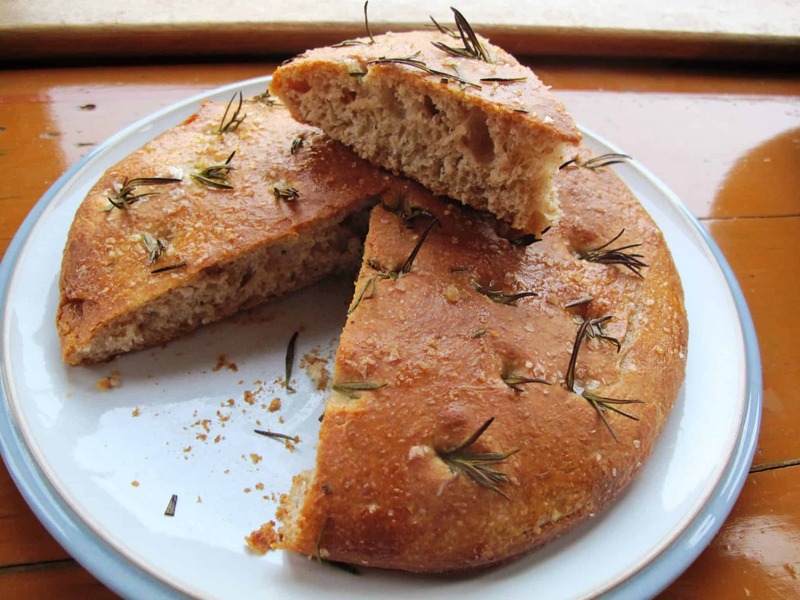 Focaccia is a flattish rustic Italian bread with an open, irregular crumb structure. 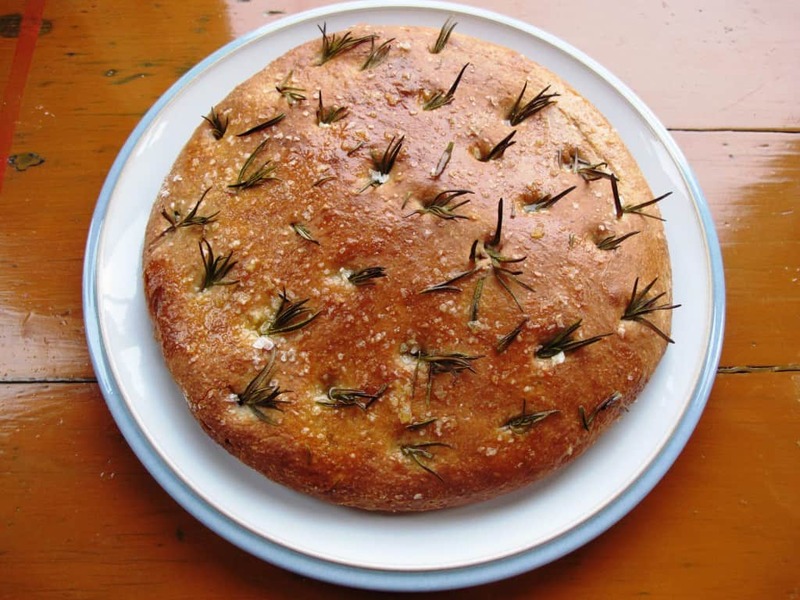 I love focaccia when it’s moist and chewy without being too oily, when it’s kept simple, with an emphasis on fresh herbs and olive oil flavours. Focaccia dough is fairly wet and sticky, but the addition of olive oil means it’s still pliable, soft and easy to work with. Additionally, I’ve added a bit of semolina and rye flour to give the bread more character. Combine 50g 100% hydration active sourdough starter with 100g water and 100g wholemeal flour. Give it 12 to 16 hours to ripen. Combine the prepared sourdough with the dough ingredients in a large bowl. Tip out onto a clean work surface and knead for approx. 10 minutes. Shape the wettish dough into a round by folding the edges into the centre. Cover the dough with the bowl (moisten the bowl’s sides and edges before you place it over the dough). Leave the dough to prove for approx. 1.5 hours. Prepare two round cake tins (approx. 23 cm in diameter) and wrap tin foil around the outside of the tin to prevent any oil from leaking. Put 2 tbsp of olive oil into each cake tin and use a brush to make sure the whole bottom of the pan is evenly coated. Lightly dust a free space on the work surface with flour. Carefully move the dough over onto the floured surface, taking care not to deflate the dough too much in the process. Divide the dough into two equal segments. Fold the edges into the centre, then place the dough parts into the cake tins, seam-side down. Very gently pull, push and prod from the centre towards the edges to obtain a roundish shape. Cover the pans with a clean dishcloth and set aside at room temperature for about 30 – 45 minutes. Use your fingers to push the rosemary into the dough, distributing it evenly. Push ever so slightly outward, towards the edge of the pan. 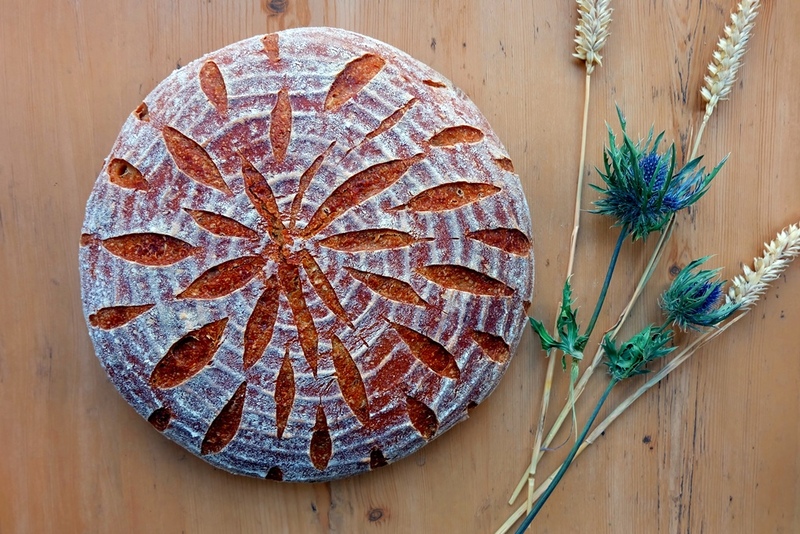 You’ll dimple the dough at the same time, giving the bread its characteristic indentations. Evenly sprinkle over the sea salt. Place the focaccias on the center rack of the oven and bake until crisp and golden-brown, for approx. 25 minutes. Remove the focaccias from the pan onto a wire rack. Finally, brush the surface of the breads with olive oil while hot to give it a nice glossy finish. Best served warm, straight out of the oven.